Growing up shopping at J.L. Hudson’s in downtown Detroit, I remember my family faithfully shopping in January for the winter white sale. At least that’s what I remember the branding of the sale to be. Living in Chicago, the sale was the same. Venture forth to the present era, and even a couple of years ago, we headed back to Chicago for the winter white sale while staying at the Drake Hotel and dining and dancing into the night. Well guess what!? We have a Winter White Sale right here in Downtown Petoskey. We also have the equivalent of the Drake in Stafford’s Perry Hotel. Now, the white involves a little snow, maybe a couple of feet to be exact, but the ski hills are open, sidewalks are clear, and the windows are dressed for anyone wishing to parade down Mitchell, Lake, or Bay Streets and take left and right turns up Howard or down Petoskey Streets. The Perry Hotel can offer dining at the Noggin Room for a nice family venture, or there’s always Chandler’s, Palette, City Park, Julienne Tomatoes, Tap 30, Pour, Duffy’s, Ernesto’s Cigar Bar, Roast & Toast, Mitchell Street Pub, Leo’s, Grain Train Café, (whew), North Perk, Jose’s, Thai Orchid……you get the picture. And the sales!!! The shopkeepers have to put the spring and summer collections somewhere, but can’t unless you come and purchase the remainder of the fall and winter closeouts. If a little weather bothers you, the Perry has an extraordinary fireplace and word has it, gallons of coffee, hot chocolate, and even a little brandy if you so desire. Not to go unnoticed, the BRAND NEW, EMGOride can get you around town and Emmet County with a simple phone call. 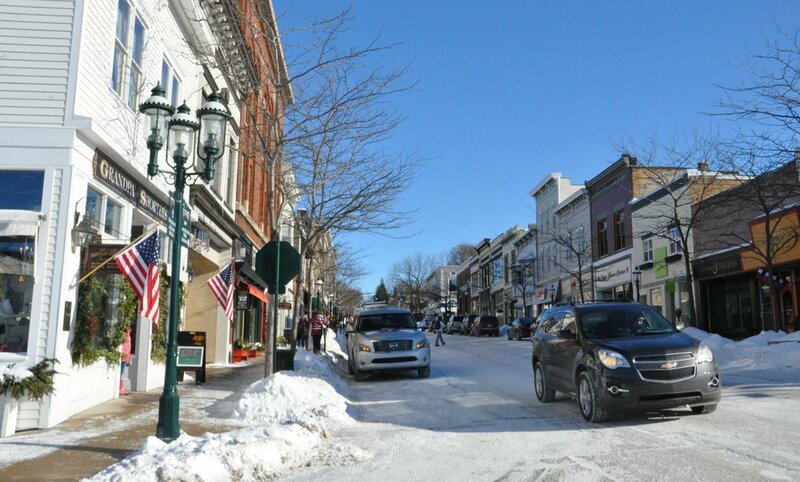 Come North and capture the essence of winter and become part of Downtown Petoskey’s northern exposure. Cutler’s, JC Penney, Grandpa Shorter’s, Northgoods, and the rest of our shops await. Or if you really want to be outdoors, the Back Lot at Tap 30 can offer you an igloo for enjoying the sun and snow while imbibing. Don’t dawdle. The weekend is upon us and temperatures are creeping higher, so now’s the time. See you soon, and don’t forget, if you truly want white linens we have those, too!